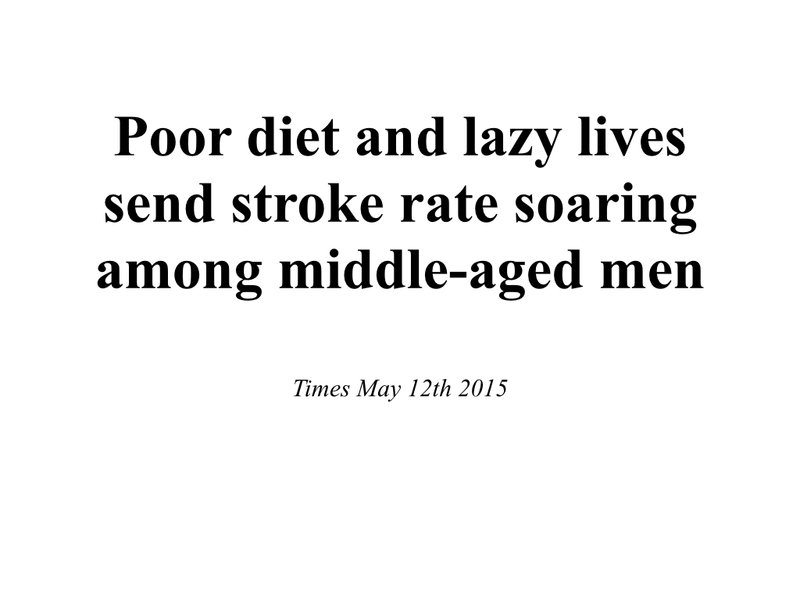 The headline was in all UK newspapers on May 12th 2015. It looks as though we are approaching something catastrophic - at least middle-aged men and to a lesser extent middle aged women. 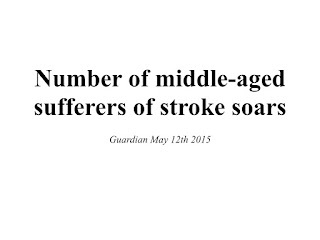 We are all of a sudden much more likely to have a stroke than was the case until very recently. This would be a true epidemic, almost like the appearance of AIDS almost thirty years ago. This is something very serious and we must be prepared. Could our hospitals and other components of health care cope? Should we all go out and obtain increasing sickness and life insurance? What we should do is apply "olfacto-statistics" - does it smell right? Is there something a bit fishy? 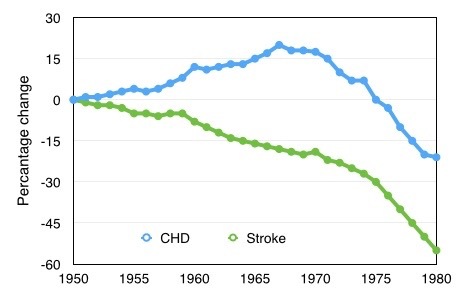 Since 1960 there has been a progressive decline in the risk of stroke and in recent years there has been a much-reduced risk of stroke occurring in an individual. In other words the risk, the incidence has been reducing. On the other hand stroke is not usually immediately fatal and the effects can last for many years. The population is getting older - there are more middle-aged and elderly people, and therefore more people at risk of stroke. 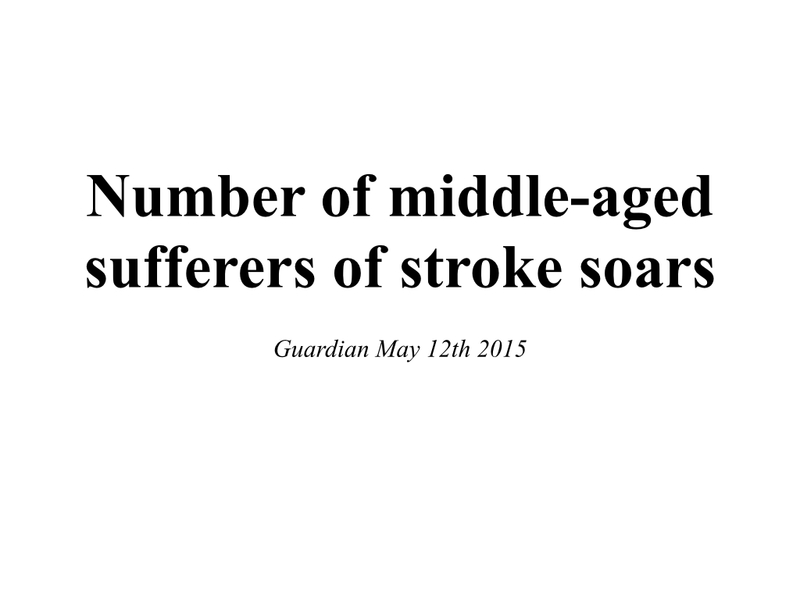 As a result there are within our population more people who have a had a stroke with disability due to it. In other words the prevalence has increased. This might have a big effect on health and rehabilitation services but it does not present a risk to an individual. 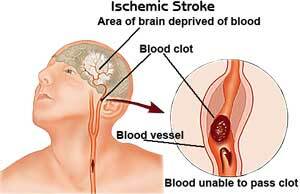 Stroke is the result of sudden impairment of the blood supply to part of the brain, which as a result does not function. The event is in medical terminology usually called "cerebro-vascular accident - CVA". Cerebral infarction would be a more accurate term. It is usually due to the blockage of an artery in the brain by the atherosclerotic process that also affects the coronary arteries of the heart, thereby causing a heart attack (myocardial infarction - MI). The incidence of both of these conditions has been reducing during the same time, as we have seen in a previous Post. The other form of stroke of stroke is haemorrhage from spontaneous rupture of an artery within the brain, predisposed by an aneurysm that might be congenital. Haemorrhage has a higher mortality. It is particularly related to high blood pressure - hypertension. The treatment of this during the past forty years has contributes to a great decline in the incidence of cerebral haemorrhage. 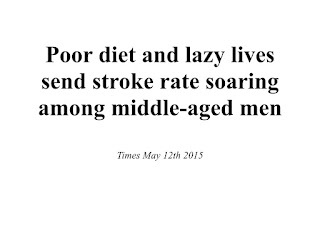 But what has happened that suddenly reverses this downward trend and dramatically increases the risk of stroke? There is as usual a clamour to jump to conclusions, to "round up the usual suspects" (as in Cassablanca). And so the headline in the Times did not just report the headline news as appeared in the press relaese but also stated that this new epidemic is due to obesity and sedentary life - eating too much and exercising too little. We have seen in a previous Post that contrary to what we are all told, evidence indicates that mild and moderate obesity gives a survival advantage over the thin. The conclusion of the Times was not justified: there has been no sudden epidemic of obesity that would have led to such a sudden epidemic of stroke. The story does smell a bit fishy, it does not make sense. It requires careful evaluation, and this was provided by the excellent BBC Radio 4 programme, "More or Less". This is a regular programme that looks at statistical statements and checks them for truth. In the edition of May 15th 2015 (available as a Podcast) it called to give evidence Tony Rudd, the National Clinical Director for Stroke NHS England. His information was that there was no epidemic: the incidence of stroke in middle-aged people is continuing to decline after all! This can be seen in the two Figures. The first shows the decline since 1950, in this example in the USA, although the timeline has been similar in the UK. The second shows more recent years, this time in the UK. The decline, which indicates risk to the individual, has been dramatic. 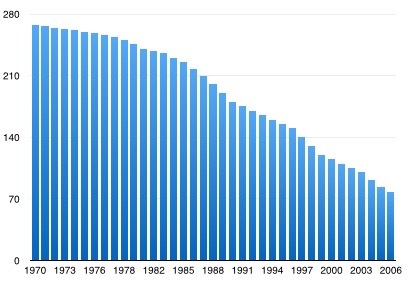 Although medical professionals tend to assume that the decline has been due to medical intervention, there might be some truth in this but it is likely that most of the decline has been "natural", for reasons unknown. 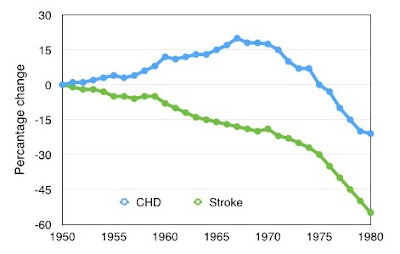 It can be seen that the decline in stroke deaths occurred earlier than the end of the epidemic of coronary heart disease (CHD). So where did the misinformation arise? Who made the press release that was taken up by all newspapers and given prominent headlines? The answer is the Stroke Association, a well-meaning body that supports and represents those suffering from or or who have died as the result of stroke. To achieve this end, and to raise money to help sufferers and research, it wishes to achieve the maximum publicity. And this it did, most successfully. A large proportion of the population will have read the headline in most national newspapers, but very few will have listened to BBC Radio 4 More or Less, and therefore will remain unaware of the truth. The announcement will contribute to national anxiety. No retractions of the headlines appeared in the newspapers. The truth is this. The Stroke Association was referring to hospital admissions, with perhaps suspected rather than proven stroke. This produces imprecise evidence. Death certificates are more accurate, but even then there are errors. Health statistics must always be treated with caution. Death rates from stroke have been falling progressively since 1960 and any reversal of this would be the result of something very serious and very new. In recent years we have seen a move to minimise the effect of a stroke by the process of thrombolysis. This is the "clot-busting" treatment that has been used in the treatment of myocardial infarction since the 1980s. It is reasoned that if a stroke is the result of a blood clot occurring on a severe atherosclerotic lesion then the clot should be dissolved as soon as possible with restoration of blood flow to the brain. The challenge is immediacy, treatment with thrombolysis given within four hours and ideally within one hour of the onset of symptoms. It as also important for an emergency CT or MRI brain scan to be performed beforehand, so as to exclude the possibility of the stroke being the result of a haemorrhage. Thrombolysis would be catastrophic in this circumstance. To achieve this the population has been encouraged to attend a major hospital immediately if the there is any suspicion of a stroke occurring. The diagnostic acumen of most people is not high and so most people admitted to hospital with what they think might be a stroke will not have had one. The timelines shown in the figures indicate deaths. The diagnosis rate in non-fatal cases, as with many disease, can change with the behaviour of patients and also the behaviour of doctors. The CT scan has been used routinely in stroke patients for about 20 years. In the more common stroke due to blockage of an artery the early CT scan has usually been normal. 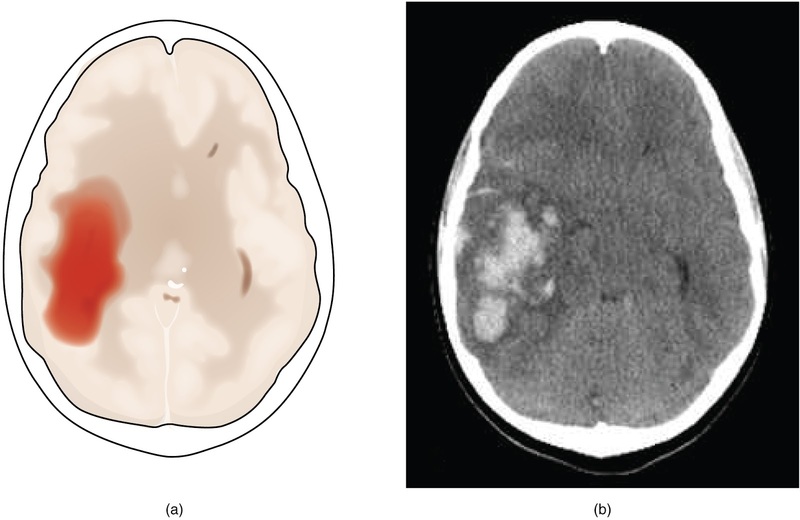 This causes confusion to patients and families, but the purpose of the scan was to exclude haemorrhage (shown above) as it would be unwise to give even aspirin to a patients who has had a brain haemorrhage. In very recent years the MRI scan has been used. This has much higher sensitivity and often shows abnormalities in even "normal" people (volunteers). Although these abnormalities can be "false positives", in people with symptoms they might be interpreted as evidence of stroke. This will cause an increase in diagnosis rate of stroke, whereas the abnormality would previously not have been detected and a diagnosis might not have been made. There is concern about the overuse of MRI scans without critical evaluation of the findings. We can see why there is an apparent epidemic of stroke. As with many present-day epidemics it is an epidemic of behaviour change and not an epidemic of disease. Careful evaluation is essential. Headlines in the newspapers can be bad for your health.